If you or a loved one has trouble reading small print, this HealthSmart magnifier can help. 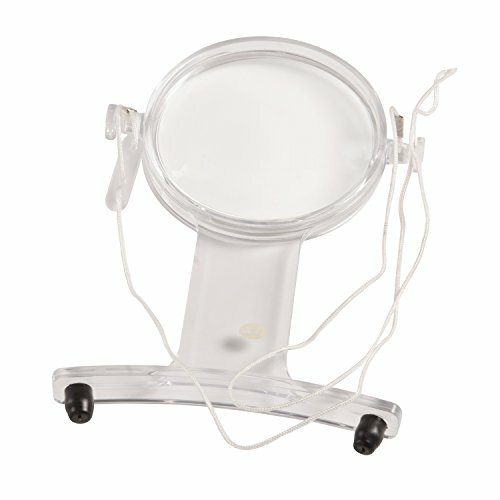 Its unique design gives you the freedom to use this magnifier hands free. Whether you are reading a book, medicine labels, maps or a restaurant menu, this magnifier enhances what you see by 3x magnification. This lightweight acrylic magnifier is specially designed for tasks done close to the body. NO HANDS NEEDED! This convenient hands-free magnifier allows you to see more clearly without the hassle of moving a magnifier with your hands. GREAT FOR READING a book, newspaper or restaurant menu. This magnifier is designed for tasks done close to the body.